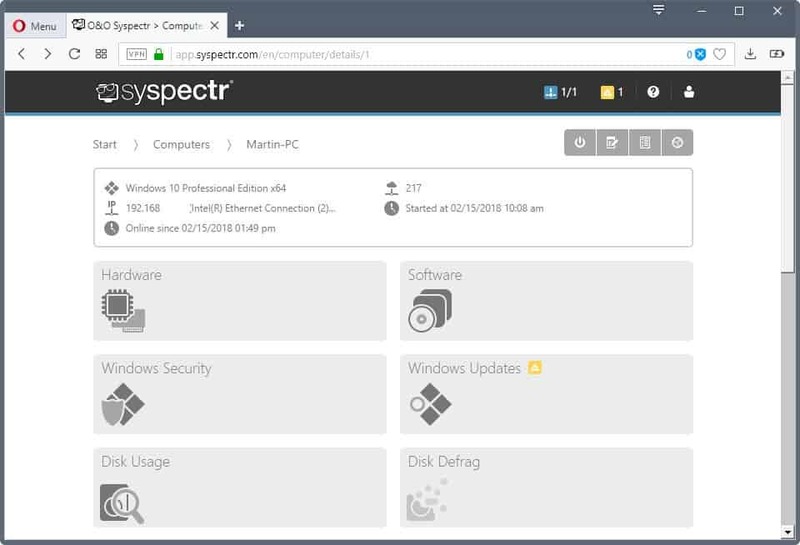 O&O Syspectr is a free remote administration and management software for Windows client PCs and servers that administrators may use to monitor and manage Windows devices. Note: O&O Syspectr uses a client and server approach. It requires that you create an account on the official website which you use to manage all devices, and to install the client software on Windows PCs that you want to manage. These PCs need to be linked to the management account then. Installation of the software should not pose a problem. It requires an Internet connection however as it needs to transfer data to the management site. You need to link it to an account and won't really notice the application anymore afterward as it runs without program window or system tray icon. The Task Manager shows the O&& Syspectr Service process however. All monitoring and managing happens on the Syspectr website. There you find a list of all Windows PCs linked to the signed-in account. A click on any PC lists the monitoring and management interface. You find basic information such as the operating system, local and remote IP address or online since date and time at the top, and the various sections that you can check out below that. You may assign an alias to a computer for easier identification and add or hide modules from the management interface. While many modules are activated by default, some are not and you can add those in the Settings. Hardware -- Lists detailed hardware information such as the motherboard make and model, installed RAM, processor, graphics processor and more. Software -- Lists all installed programs, names, publishers, installation dates and size on hard drive if reported. Windows Security -- Displays security related information, for instance, if the firewall is activated, if antivirus is installed, or if automatic updates is enabled. You can enable and disable the monitoring of specific items on this page. Windows Updates -- Lists installed, important and optional updates. You can select updates for installation, and hide updates as well. Disk Usage -- Shows all connected hard drives, names, sizes and partitions. You can disable the monitoring of specific partitions or entire hard drives. Drive Monitoring -- Runs an analysis of available hard drives when you select the option for the first time. You may use the program to monitor and manage processes, run PowerShell scripts, use remote console and desktop, and to create a full system report. O&O Syspectr is designed for business-use as you can control multiple Windows PCs and servers using it. It is not super-effective when you use it on a single PC, but if you manage PCs of family members or friends, or devices in a small network or company, you may find it useful for that purpose as it informs you about issues. Install important and optional Windows updates. Hard drive monitoring including quota, overheating and other hard drive related issues. Software and hardware inventory of machines. Run scripts and remote operations. O&O Syspectr is a professional-grade remote administration software for Windows devices that is free to use. Now You: How do you manage PCs? Thanks for sharing this, Martin! Honestly, we wouldn’t go with one of those products. They all store extremely detailed data of customers’ computers somewhere in a cloud and no one knows what happens then. When a distributor once offered a managed service like this we quit after we found out by accident all data was to be stored at Amazon WS in the US. With this coming to light several partners denied to sign in so in the end they at least agreed to use servers within Germany instead. And we found out more about what it does and what we surely didn’t want to see from a service like this. In the end we would have sold our customers’ privacy for good. All data once being sent to the cloud will stay there. Though it might be even a helpful piece of software, yes, but it collects everything it can grab. After testing several products like these and having a chance to look behind the curtain we never ever would recommend tools like this to our customers. This mirrors just our personal experience and opinion. I agree security / privacy is the big concern. Otherwise it would be very handy for us poor sods who are defacto IT departments for family and relatives.